As Indians really, really love their food, this is an easy topic to start conversation over. So mentioning that I haven't had Chicken Tandoori, they started planning. Today, during lunch we would go out on motorbikes to a good restaurant. So that's what happened. We took off in a taxiriksja, to my disappointment to Naaz. Quite a ride, again a trafficjam, lot's of honking, squeezing, manouvering. At Naaz my collegue with the biggest appetite and a nack for organizing all the food (hi Chirag!) makes sure we have everything and then we wait. The Chicken Tandoori arrives and is just as I remember it. Tasty, spicy, tender. Next dish, naan with two gravy's (forgot the names). The butter paratta is amazing. Never again will I eat it in the canteen. The dishes are empty and I feel like a stuffed turkey. This is, however, not the end. Dessert is ordered. It looks great. My colleagues invite me to 'jump in' but I cannot. Too much delicious food. 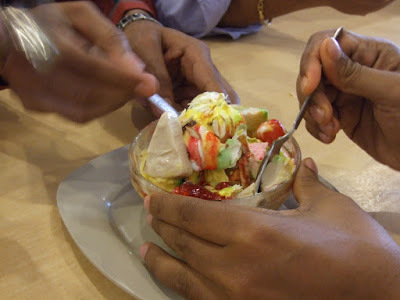 Doesn't the icecream look like a gift from heaven? We leave the restaurant and I get a ride back to the office on a 125cc motorbike. I turn down the offer to drive myself. Not being used to the Mumbai traffic I fear mayhem is lurking around the corner. We drive through the enchanting neighbourhood of Ghatkopar. It seemed like a french city with the colours faded. But cosy and lively. So Mumbai is not only slums and posh hotels but has it's nice pockets of 'normality'. Cruising over the highway at 60 km/h (I was given a helmet, which is an exception ;) ), wind blowing, we overtake cars and taxiriksjas left and right. At the highway end, we take a left turn and are stopped by the police. Seems we neglected a stop. After slipping the policeman Rs 100,- we are free to go. The policeman threatened to take him to court and take his drivers license from him. Now that's what I call crimefighting! 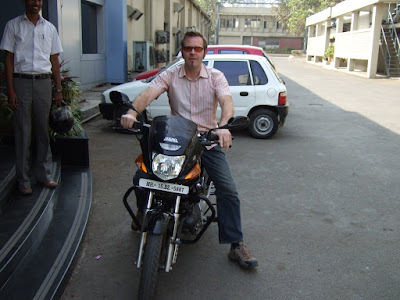 Having returned at the office, my colleagues insist I take a short ride on the bike. Actually craving for a ride I jump on and take off. Driving around the building I surprise them. Seemingly, not everybody knew that it was possible to go all the way around. The lunch was so heavy I couldn't eat dinner at the regular hour. I now understand why Indians have a hard time after lunch, the food is quite heavy on the stomach. Yet another memorable day.